On 19th November, in Slovenia, Dr.Simone Bellassai, CDR WineLab® Specialist, will give a presentation in the Wine Day at Ljubljana Slovenia on how the CDR WineLab® system can help improve wine quality by reducing the time of analysis during the winemaking process in a user friedly way. Again this year, at Ljubljana, there will be The Wine Day hold at The Agricultural Institute of Slovenia, the leading research institute in the field of scientific researches accreditate to check quality of agricultural products. Between the rapporteurs who will speak about local wines, hyperspectral imaging technique useful for process control and slovenian wine chemical parameters Dr. Simone Bellassai, chemist and enologist, will take an important speech about “CDR WineLab®: improve your wine quality” with whom he will show the innovative elements of CDR WineLab® system and he’ll draw a comprehensive overview of current winemaking techniques. Innovation is one of the most effective way to take on the challenges that the wine sector will face in the future. 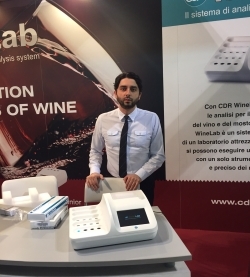 In detail, CDR WineLab® has been designed to support the work of oenologists and wineries and to adapt to their analytical needs. CDR WineLab® allows to control the maturity of grapes, to monitor in real time the winemaking process and to monitor wine status during ageing. The winemakers and oenologists know that the reduced time of analysis is a very important advantage during winemaking and the harvest to improve the wine quality. It’s very important to have an intuitive system which allows to make analysis in real time, without using an equipped laboratory. For example, CDR Winelab allows to analyze YAN directly in winery thanks to the photometric technology without using toxic reagents; it’s also possible the monitoring of malolactic fermentation with only one analytical session to determine Malic Acid Lactic Acid. The event will end with an aperitif and the tasting of prestigious labels. CDR WineLab®, analysis system for quality control in winemaking, at the Wine Day at Ljubljana was last modified: May 22nd, 2017 by CDR s.r.l.